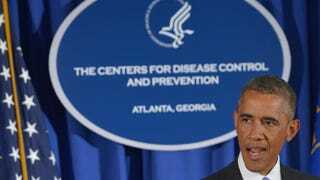 President Barack Obama speaks following meetings at the Centers for Disease Control and Prevention on Sept. 16, 2014, in Atlanta. The World Health Organization and the United Nations sent out the equivalent of an emergency distress signal Tuesday after reports that the number of people in West Africa infected with the Ebola virus now nears 5,000. More than 2,400 people have died from the disease, the New York Times reports. What’s even more alarming is that half of the new infections and deaths occurred within the past three weeks—which suggests the outbreak is getting worse. The United Nations issued its own version of a emergency flare during the same press conference Tuesday, describing how containing the Ebola outbreak will be a massive international effort that will likely cost upward of $1 billion—10 times the number it asked for last month. President Barack Obama immediately responded in kind and is planning to send 3,000 military officers to Liberia “to coordinate the international effort to combat the disease”; train approximately 500 health care workers per week, since that region has endured the most infections and deaths; set up a command center in the nation’s capital, Monrovia; and manage the construction and operation of approximately 17 treatment centers that will house about 1,700 beds. The U.S. will also send 400,000 at-home health kits, as well as more than 10,000 testing kits that can be used to detect the disease. While nations around the world scramble to ratchet up their resources and donations sent to the region, the White House fielded criticism from those who say the U.S. didn’t do enough to initially slow the Ebola outbreak. According to the Times, White House brass have balked at the notion that they have been “slow to act” in facing the Ebola crisis. “The [Centers for Disease Control and Prevention] has responded commensurate to the seriousness” of the crisis, Josh Earnest, the White House press secretary, told reporters Tuesday afternoon. The Times also noted that since the Ebola outbreak, the CDC and the government have committed more than $100 million. Read more at the New York Times here and here.